If you are looking for hardworking and proficient drywall contractors in Indianapolis, look no further! 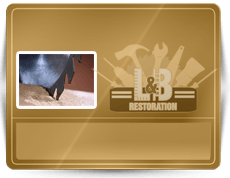 Restoration By L & B, LLC provides the finest craftsmanship for drywall repairs and services, for both residential and commercial properties. We are fully equipped and experienced to provide all drywall repairs and services; from hole patching, to ceiling repair, and much more! We offer all-inclusive drywall services at a price anyone can afford! Patching up drywall is an important part of maintaining the value of a home or property. Because most drywall mishaps are caused by poor plumbing or water leaks, such projects are more complex than they appear. It requires significant experience and training, understanding and knowledge, as well as, the proper tools and resources to successfully carryout an accurate drywall repair or patch job. Be sure to always trust a qualified and insured home remodeling service for all drywall work you require for your home. Call our home remodeling contractors at 317-454-3612 for professional drywall repair services and patchwork in Indianapolis, IN and its surrounding counties, today! When you call our Indianapolis drywall repair contractors, you can expect a prompt hello, professional answers, and friendly service. When we arrive at your home, you can anticipate punctuality, professional attire, and sophisticated conduct at all times. We are firmly dedicated to exceptional customer support, quality service, and skilled workmanship. We are always respectful of your home, and we work in teams for increased productivity and efficiency. Our contractors thoroughly examine and inspect the drywall area that needs repaired, and assess its condition. Once this is complete, we begin by discussing the possible avenues of repair and replacement with our clients. We never use confusing industry jargon or slang when talking to our customers; instead, we use a language all home and property owners can clearly understand. This way, we are sure our clients are well-informed and aware of our agendas. Minor water damages will require the use of an accelerated primer, while most other drywall repairs will require sanding and patchwork. When it comes to drywall services, we can do it all! You name it, we can do it! Our company believes in all-inclusive customer support, which means we also sincerely respect our client’s home. Drywall repairs can be quite messy, so we are sure to cover all electronics, furniture, and more with plastic tarps and canvases; and then we are thorough in cleaning up all mess and debris left over from the job. We haul away old or damaged drywall and all related waste once our job is finished; but our customer support extends long after our projects are complete. Call 317-454-3612 for quality drywall repair services in Indianapolis, IN today. 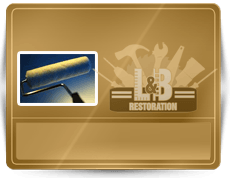 When you need professional painting contractors in Indianapolis, call Restoration By L & B, LLC at 317-454-3612 today. We are qualified and insured painters that provide a wide-range of interior painting and exterior painting services for both residential and commercial properties. Our highly trained and experience painting contractors use first-class painting supplies and the highest-quality paint products on the market. We also happy to accommodate clients who wish to choose their own paint and plaster materials. Whether it’s a new construction home with only drywall in place, home siding that needs an update, or a room that simply need a fresh look and feel, our skilled painters can offer you professional painting services with flawless results. Don’t trust a painting job to a novice next-door neighbor, or a stranger you found on Craigslist; painting is a skill that not all people possess. It requires years of practice and the use of comprehensive methods to achieve a satin finish and unblemished results. Our painting contractors retain these skills, and more, when it comes to home restoration and remodeling services. You name it, we can do it! Call us today at 317-454-3612 and speak with a friendly and knowledgeable company owner about our painting services in Indianapolis, IN and its surrounding counties. Our painting consultants work side-by-side with our clients to determine the best possible approach for their painting and drywall needs. 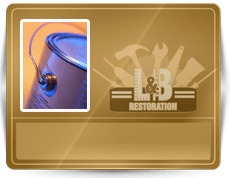 We stay committed to solving problems and discovering solutions to all your interior and exterior painting needs and concerns. We discuss all of these prospects at the time of the estimate, and work diligently with our clients to find a solution that will yield their desired results at the best value possible. In fact, we offer the most competitive prices in town, which means our clients always receive the best value! If you find a better deal by a competing painting company, we will not just match their price, we will BEAT it! Contact us at 317-454-3612 to learn more about our company and our esteemed painting contractors in Indianapolis, IN today.